So in just trying to keep my small home studio busy (by finding clientele by jabbering on the Facebook local pages and word of mouth), I’ve also inadvertently opened myself up to this whole other realm of teaching. By writing articles and hosting so many workshops and opening them up to Skype and private video link, I have been blessed with making many friends globally in our industry and have got myself on the ‘if you’re ever passing through Temecula’ it’s really great to have the opportunity to meet so many of the teachers I ‘talk’ with regularly on the forums, I’m always a bit starstruck and humbled that they chose me. Sunni Almond is a true believer in the power of Classical Pilates, the one that came from Joe and Clara Pilates. She teaches Classical Pilates on classical apparatus in her studio Studio S Pilates in Temecula, CA. Sunni has also started a FREE collaborative facebook group called Going More Joe. 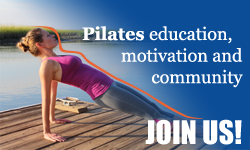 It’s an open and friendly community where you can ask your Pilates-related questions (especially if yu are wondering whether transitioning to a Classical way of teaching is the right road for you!) and receive kind, honest and professional asnwers. Check out Sunny’s studio or contact her to schedule a session – click here.